Hydraulic mines become the largest sources of gold until curtailed by court order in 1884. Lode mines and dredges were the principal sources after that date. During the depression years of the 1930s, gold output in the state was nearly as high as it had been during the gold rush. 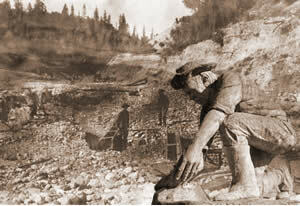 Gold mining was curtailed during World War II and has not recovered since. A number of spectacular nuggets and masses of pure gold were recovered in California during the early days. The most famous were the 195-pound mass of gold from Carson Hill and the 54-pound Willard nugget from Magalia. Small high-grade ore shoots or pockets have been found in many districts, but the richest and most numerous have been in the Allegany district of Sierra County. Although gold is found in many areas in California, the most productive districts are in the northern and central portions of the Sierra Nevada. The primary deposits usually consist of gold-quartz veins in metamorphic rocks and are associated with the intrusion of the Sierra Nevada batholith. In the Klamath Mountains, the second most-productive province, the largest sources of gold have been the streams of the Klamath-Trinity River system. The older terrace deposits along the sides of the present stream channels also have yielded much gold and were mined by hydraulicking. The Basin Ranges and Mojave Desert provinces of eastern and southern California have yielded substantial amounts of gold. The gold occurs either in epithermal deposits in brecciated silicified zones of Tertiary volcanic rocks or in mesothermal quartz veins of older metamorphic and granitic rocks. Gold also has been recovered from dry placers in several districts. Moderate amounts of gold have been mined in the Transverse and Peninsular Ranges in southern California. The mineral also has been recovered from the Modoc Plateau province in northeastern California. Small amounts of gold have been produced in a number of places in the Coast Ranges. California's gold-mining history is a brilliant lure, and many books, pamphlets, periodicals and articles have been published on the subject. The old mining districts and settlements, including "ghost" towns, are visited by increasing numbers of tourists each year. In a few districts the old camps have been reconstructed. Several old gold mining towns, such as Columbia, Johnsville, Coloma, Shasta, and Bodie, are California state parks or recreation areas. In recent years more people have become aware of the importance of California's gold rush in the history and development of the western United States, and steps have been made to preserve historical structures and equipment closely associated with gold mining. Unfortunately, little visible evidence remains of many of California's important gold-quartz mines other than caved shafts and tunnels and heavily overgrown dumps. The surface plants of the large underground lode mines at Grass Valley and along the Mother Lode belt, which for years accounted for a major part of California's gold output, have been almost completely dismantled. More evidence remains of the large-scale placer-mining operations. The old hydraulic mine pits and the extensive tailing piles in the dredging fields still exist; some are used as commercial sources of sand and gravel. A number of the old ditches, flumes, and reservoirs that once supplied water to the hydraulic mines now are parts of hydroelectric and irrigation systems. Edited from: Gold Districts of California, by: W.B. Clark, California Department of Conservation, Division of Mines and Geology, Bulletin 193, 1970.